The importance of prioritising assistance to the most vulnerable populations, in particular internally displaced peoples. 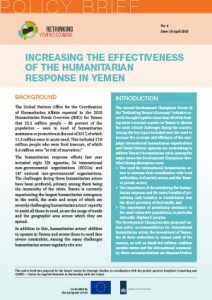 The Development Champions also proposed various policy recommendations for international humanitarian actors, the Government of Yemen, the de facto authorities in various parts of the country, as well as Saudi-led military coalition member states and the international community; these recommendations are discussed below. The humanitarian response efforts last year included eight UN agencies, 36 international non-governmental organizations (INGOs) and 147 national non-governmental organizations. The challenges facing these humanitarian actors have been profound, primary among them being the immensity of the crisis. Yemen is currently experiencing the largest humanitarian emergency in the world, the scale and scope of which are severely challenging humanitarian actors’ capacity to assist all those in need, as are the range of needs and the geographic area across which they are spread. Financial challenges (including the widespread liquidity crisis, volatile currency exchange rate and rapid price fluctuations). All of these factors have also heavily impacted humanitarian actors’ ability to conduct needs assessments, monitor outcomes and gather other data critical to implementing timely evidence-based programming. The warring parties’ sensitivities to such data collection, in particular in Houthi-controlled areas, has also often led them to actively block such activities. While the Humanitarian Country Teams (HCTs), Clusters, and Inter-Cluster Coordination (ICC) between the international humanitarian actors are well established and functioning, there is limited coordination with the Yemeni private sector and with other local actors. This creates an inherent gap between the demand and supply of aid supplies within the country. It misses the opportunity for the humanitarian actors to address their current inability to stock food and supplies at sites around the country and potentially increases costs of delivery as the humanitarian actors try to build their network and infrastructure for delivering aid to locations where they did not operate previously. Expand the concept of ‘humanitarian response’ to include recovery efforts. Ongoing humanitarian emergency interventions should help lay the foundations for the near-term rehabilitation of locally provided essential services and help improve the livelihood opportunities for populations in need. This is crucial for long-term national stability and to avoid entrenched aid dependency in Yemen. Increase efforts to coordinate with local authorities, civil society actors, and the Yemeni private sector through participatory planning and implementation processes (while recognizing that potential for local coordination varies widely across Yemen depending on local circumstances). This would help ensure a more effective, comprehensive and integrated humanitarian response, while also reducing international humanitarian actors’ operational costs and human resources burdens. Humanitarian actors should regard increased coordination with the Yemeni private sector in particular as an opportunity to circumvent obstructions in aid delivery and management and to speed aid delivery efforts; (please see International Aid Organizations and the Yemeni Private Sector: The Need to Improve Coordination in Humanitarian Crisis Response for detailed recommendations). Establish in-country negotiation teams mandated to maintain strong communication channels with the belligerent parties to facilitate unimpeded access for humanitarian aid delivery to all areas of the country. Such efforts should leverage increased coordination with local authorities, civil society actors, and the Yemeni private sector. These efforts should also include a program to educate cadres of the warring parties of their obligations under international humanitarian law. Decentralize the relief effort through the creation of relief centers or ‘hubs.’ These hubs should be distributed across the country according to both ready access to humanitarian imports – whether by land, sea or air – and proximity to the largest concentrations of populations in need. Develop a comprehensive risk management framework, as well as a unified monitoring and evaluation system that reviews the humanitarian response as a whole. Such would allow for accurate needs assessments and help identify strengths, weaknesses, opportunities and threats within the current aid delivery model. It would also increase transparency and accountability in aid delivery, which in turn would help forstall donor fatigue. Generally prioritize cash transfers over food baskets in the delivery of humanitarian aid to beneficiaries. Cash transfers have positive multiplier effects for local economies, assisting small vendors and the market as a whole to keep running, while also strengthening local credit systems and community-level resilience. Prepare and implement a plan to build and empower national staff capacity to take on senior decision-making positions, with a core principle of this to be gender-inclusive. This would contribute to more flexible and effective humanitarian operations. Conduct local level needs assessments for humanitarian interventions and ensure the delivery of aid to targeted groups according to their needs. This should take into consideration the various geographic and demographic differences, as well as the deteriorating economy and escalating armed conflict. Ensure the implementation of fair aid distribution mechanisms, with a specific focus on women who are the breadwinners for their families, given that the conflict has further marginalized women’s ability to access employment, services and aid. Monitor the efforts of local civil society actors and NGOs working in the humanitarian response effort to identify opportunities to invest in local capacity building and collaboration. Individual INGOs should develop a partnership strategy that ensures long-term local resilience and capacity handover. Obligate the Higher Committee for Humanitarian Relief to take up its supervisory and coordination role in promoting wider and more effective coverage in the humanitarian response and prevent duplication of efforts. This includes: develop and implement a proactive plan to coordinate with and support international organizations and UN agencies in the humanitarian response; assist humanitarian actors in securing the smooth import of humanitarian supplies, visas for foreign staff to enter the country, safe areas to house staff and supplies, and secure transportation corridors through conflict zones; facilitate humanitarian access to communities in need – including internally displaced peoples – and carrying out field surveys to identify specific needs in various areas; coordinate with the technical bodies in Sana’a to ensure more effective aid monitoring and coordination. Actively pursue policies to prevent armed groups and belligerent parties from interfering with the activities of humanitarian organizations operating in Yemen, recognizing that the situation aid organizations face varies widely depending on the areas in which they operate. Prioritize and initiate the rehabilitation and reconstruction of basic infrastructure necessary to increase the flow of humanitarian aid to Yemen and to facilitate its movement across all governorates. Help build the capacity of local authorities and remove legal and procedural restrictions that may inhibit their ability to support international organizations in responding to the humanitarian crisis. Actively engage with the Saudi government regarding waiving or reducing taxes and fees for the Yemeni diaspora in Saudi Arabia and granting them a temporary exception from the latest expat employment restrictions, which would allow for increased remittances to Yemen. Remove bureaucratic obstacles that complicate and delay the entry of humanitarian aid workers to Yemen. Remove travel permit restrictions for humanitarian aid workers within Yemen and facilitate their secure and unimpeded access to populations in need. This includes preventing the extortion of aid workers at checkpoints. Remove restrictions imposed by staff within the Sana’a-based Ministry of Planning and International Cooperation that are limiting humanitarian organizations’ ability to carry out needs assessments and monitor humanitarian aid delivery. Allow the resumption of commercial flights to Sana’a International Airport. This will facilitate the travel needs of those requiring urgent medical attention outside the country, as well as help facilitate the movement of humanitarian aid workers and supplies in and out of northern Yemen. Permanently lift restrictions on commercial and humanitarian importation of food, fuel, and medical supplies to all ports in Yemen, in particular the Red Sea port of Hudaydah. Undertake steps to restore the functional capacities of the Central Bank of Yemen, as detailed in the Rethinking Yemen’s Economy policy brief entitled: Restoring central bank capacity and stabilizing the rial. Among many other positive outcomes, this would help stabilize the price of basic commodities in the market and thus increase the effectiveness of humanitarian aid cash transfers to beneficiaries in Yemen. * This policy brief was prepared by the Sana’a Center for Strategic Studies, in coordination with the project partners DeepRoot Consulting and CARPO – Center for Applied Research in Partnership with the Orient. * Note: This document has been produced with the financial assistance of the European Union and the Embassy of the Kingdom of the Netherlands to Yemen. The recommendations expressed within this document are the personal opinions of the Development Champions Forum participants only, and do not represent the views of the Sanaa Center for Strategic Studies, DeepRoot Consulting, CARPO, or any other persons or organizations with whom the participants may be otherwise affiliated. The contents of this document can under no circumstances be regarded as reflecting the position of the European Union or the Embassy of the Kingdom of the Netherlands to Yemen. This two-year project, which was launched in March 2017, is an initiative to identify Yemen’s economic, humanitarian, social and developmental priorities in light of the ongoing conflict in Yemen and to prepare for the post-conflict recovery period. The project aims to build consensus in crucial policy areas through engaging and promoting informed Yemeni voices in the public discourse, and to positively influence local, regional and international development agendas. The project has four components: (1) in the Development Champions Forums, Yemeni experts and professionals in social and economic development will identify key issues for intervention and provide recommendations towards tackling these issues; (2) in the Research Hive, the project consortium will – based on the issues and recommendations of the Development Champions – conduct research and identify best practices and lessons learned from international experiences to create knowledge capital for the Rethinking Yemen’s Economy initiative; (3) in the public outreach component, the consortium will implement consultation workshops with local stakeholders, including the private sector, youth and civil society organizations; moreover, campaigns through both traditional and social media outlets will be conducted to engage the wider Yemeni public; (4) and through regional and international engagement the consortium will inform stakeholders of project outcomes and aim to motivate and guide the international community’s policy interventions to the greatest benefit of the people of Yemen. DeepRoot Consulting is a dynamic social enterprise passionate about Yemen’s development. DeepRoot aims to help international development actors, the private sector, local civil society organizations and the Yemeni Government anchor their interventions in a deep understanding of Yemen’s national and local contexts, and international best practices. Our leadership team and advisory board has decades of combined experience working in Yemen and internationally in the public, private and nonprofit sectors. The Center for Applied Research in Partnership with the Orient (CARPO) is a Germany-based organization whose work is situated at the nexus of research, consultancy and exchange with a focus on implementing projects in close cooperation and partnership with stakeholders in the Middle East. The CARPO team has long-standing experience in the implementation of projects in cooperation with partners from the region and a deep understanding of the Yemeni context.